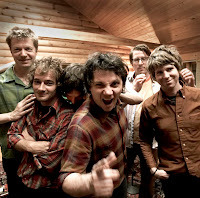 Hola Lola: Jeff Tweedy, Where are you???? Let me back up a bit....before the show we met up with one of Clay's work colleagues which I was happy to finally meet. I was also glad to meet his wife who I really liked. They have a similar story to us....born & raised in Texas, moved away for several years (them Chicago/us NYC), came back to Texas to be around family and now we all live in one of the best cities in the world... Austin. They also have a 21 month old so we're excited to get the kiddos together soon. Anyway(I digress), they had backstage passes to meet the band after the concert. ARE YOU KIDDING ME!!! I was very envious until they ever so kindly gave me the best news I've heard in a while (which was last Thursday when we found out we won the ACL tix). They needed to get back to their little one and wouldn't be able to take advantage of the backstage VIP passes. They asked us if we wanted them. UMMMM....YES!!! I proceeded to tell them that I would marry Jeff Tweedy in a heart beat if he would take me (this is all in good fun b/c of course I would never leave the #1 man in my life). Clay's response to this was "You would go from ugly to uglier". Granted, Jeff Tweedy isn't the best looking man in the world but to me he is b/c he's basically a genius...a poet...I really do love him and he inspires me on a daily basis with the songs he writes and produces. Thanks Jeff. 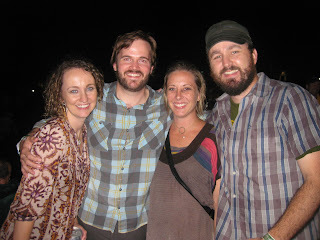 Well, to make a long story short (or maybe this is making a long story long), we went backstage and met the band. I proceeded to make a fool out of myself and couldn't speak b/c I was so nervous being around my "favorite band"...my "favorite poets". I said stupid things like "I love yall so much" or "I'm your #1 fan". Seriously Amy....is this all you could come up with??? Anyway, this was all great, HOWEVER, Jeff Tweedy was no where to be found. JEFF TWEEDY, WHERE ARE YOU???? We waited and waited and waited until 2:00 a.m. actually. We even stalked the area where the buses were waiting for a glimpse. I asked one band member to please go wake Jeff up as I'm his "#1 fan"...OMG...what an idiot I can be. In summary, I never met the #2 man in my life but I still feel confident the day will come...surely! 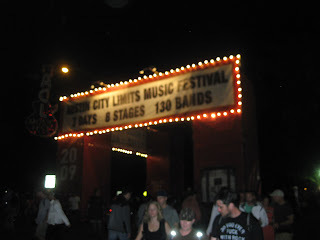 As you know, we went to ACL last weekend and have had a week full of music. Thought I would post some pics from the festival. The weekend was one of the best weekends I've ever had...just fabulous....will definitely be on the top of the list in the memory book. I can't imagine how it would have been without Molly & Ben there to experience it with us. We listened to great music the entire weekend. This didn't happen without a car running over my foot though. Yes, I did just slip that in...a story for another time..no fear...I'm ok! Again, thanks to everyone for voting for our rockin' kid. I have to say...life is pretty good and it's all about having fun in the process and you helped us get there with all your votes. There is nothing better than this festival! So many bands...so little time! 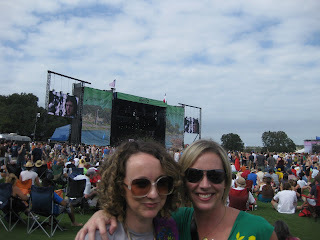 Me & Molly during Avett Brothers....another favorite band. 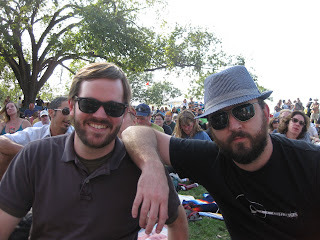 Clay & Ben before The Wood Brothers...a highlight of the festival. We walked home every night from the festival. 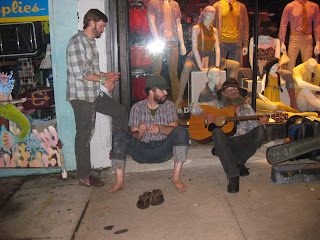 This night Clay & Ben decided to stop and sing a tune with our local homeless guy. 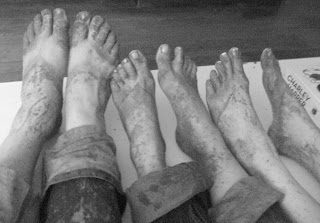 There is only one thing to say about this...dirty, dirty feet!! !